A missing tooth is more than just a hindrance to normal chewing, and more than a cosmetic bother. It’s a threat to the entire architecture of your mouth. So replacing a missing tooth with a bridge, or repairing a broken down tooth with a crown, is important for your dental health. 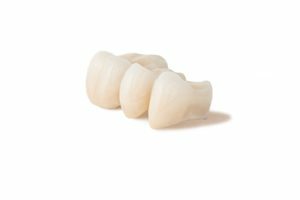 A crown (or “cap”) is a restoration placed over a tooth that cannot sustain a conventional filling. By covering the biting surfaces and sides of the tooth, a crown strengthens the damaged tooth by binding together the remaining structures. Depending on the location of your restoration, we may construct it from any combination of metal, porcelain, or other dental ceramics. When finished, your new crown will look and feel natural—and make your mouth whole again!